Ernesto Valverde, Sergio Busquets and Arturo Vidal were unanimous in criticising the decision to send off Barcelona defender Clement Lenglet after a VAR review in Sunday's 2-2 draw against Girona. Lenglet was dismissed during the first half of his maiden LaLiga appearance for Barca after clashing with Pere Pons, with Girona striker Cristhian Stuani striking twice to turn Sunday's game around at Camp Nou. Replays indicated Lenglet caught Pons with his elbow but, despite Gerard Pique's header salvaging a point for last season's champions, Valverde was unhappy with the decision. "The red card changed the game," said the head coach, whose side remain above Real Madrid at LaLiga's summit on goal difference. "Until then we had it under control, then they equalised before the break and we had to come back. "I have not seen the replay on television. The elbow is the first red card in which the player who makes the mistake asks for forgiveness. "I suppose that the VAR does justice and I have the feeling that it is not a red card. There may be some contact, but I do not think it was an aggression." Busquets accepted there was contact between Lenglet and Pons but disagreed with the eventual decision by referee Jesus Gil Manzano. "Until the dismissal we went well, then, with one less, we have an uphill battle," Busquets said. "We tried, we had the draw and we looked for victory. But with one less it was very difficult. "Maybe there is contact, you can see it in the image, but the ball is on the ground. "It's a natural movement that does it, it's not aggression. 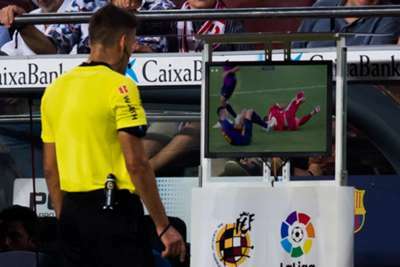 The VAR would have to be used correctly and with the same criteria." Arturo Vidal, who set up Lionel Messi for Barca's opening goal, agreed with Busquets and Valverde over the Lenglet call. "We were very sad because we deserved the win," Vidal said. "Something like this cannot happen in a game because it determines the result. "We saw the play on the video and I think the VAR should be to help, not to harm."